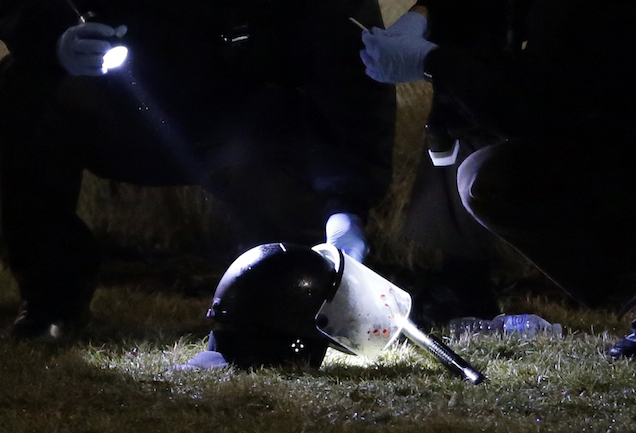 Two cops were shot early Thursday morning during a protest outside the police station in Ferguson, Mo. The St. Louis Post-Dispatch confirmed the reports, noting that "several members of the media, including a Post-Dispatch reporter and photographer, were near the officers who were hit." The shots were fired as police were confronting protesters who had gathered outside the police station...The shots rang out as the protests appeared to be dwindling. Some of the protesters fell to the ground and others ran. It's still unclear who fired and why, but early reports indicate the assailant was not part of the group protesting outside the station: witnesses say the shots came from the general direction of a "block of homes on Tiffin Avenue." UPDATE 10:30 am: At a press conference, St. Louis County Police Chief Jon Belmar described the shooting as an "ambush" and said the injuries to the officers were not life-threatening. He also said there are no suspects but police are exploring several leads. Photos from the scene were also released. A 32-year-old officer from nearby Webster Groves was shot in the face and a 41-year-old officer from St. Louis County was shot in the shoulder, St. Louis County Police Chief Jon Belmar said at a news conference. Both were taken to a hospital, where Belmar said they were conscious. He said he did not have further details about their conditions but described their injuries as "serious." "I don't know who did the shooting, to be honest with you," Belmar said, adding that he could not provide a description of the suspect or gun. Couple of Ferguson witnesses tell me they heard shots whizzing past their heads. One saw a muzzle flash from up the hill by Andy Wurm's lot. To be crystal clear: Three witnesses tell me shots at Ferg. PD didn't come from demonstrators, but up Tiffin Ave. on the hill by Andy Wurm.